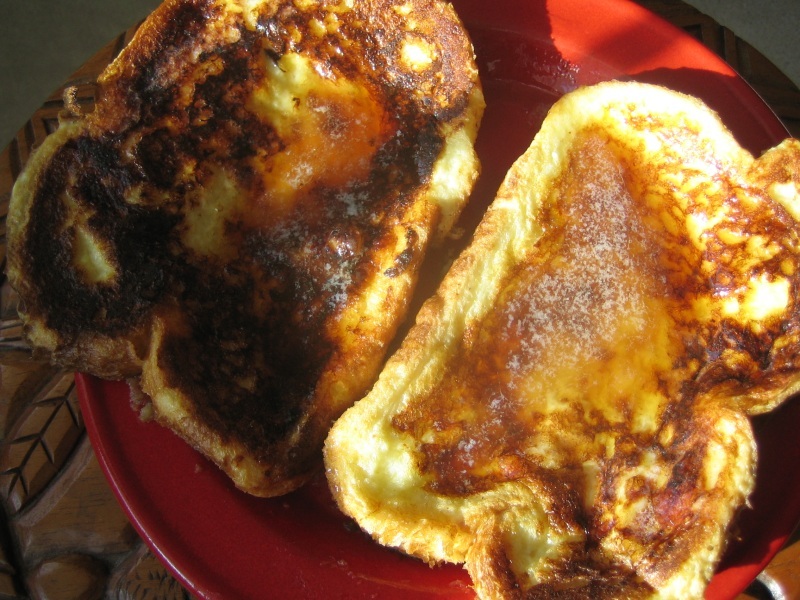 French toast is a controversial breakfast in my home because my wife isn’t a fan and until this month that meant my children weren’t interested either. I make breakfast Sunday mornings and appeal to the masses with pancakes or waffles, but a few weeks ago I made French toast for myself and my daughter became interested in what I was eating with butter and syrup. Daughter and son each had a plate and became fans: they seem to enjoy the butter and syrup the most and whatever medium gets them the fat and sugar is fine. I enjoy a custard like French toast so my go to recipe is four eggs, one cup milk, one teaspoon vanilla and one teaspoon sugar. I enjoy thick cut white bread and give it a good long soak so it absorbs as much of the liquid as possible and really puffs up on the griddle. For the children I’ve been using a short soak so they get the flavour but aren’t overwhelmed. Of course egg bread, raisin bread, rye with caraway and pretty much anything sliced works for French toast. It’s all good. Friends of mine have suggested milk replacements like orange juice but that takes away from the custard like flavour and souffle texture that I enjoy. Chocolate milk isn’t too bad if you leave out the sugar from my recipe but it’s an acquired taste. Cream didn’t add enough for me to swap it for the whole milk I normally use. I really don’t understand why you can’t get a decent French toast at a hotel or breakfast. To me they always seem under soaked in the batter, dry and tough to eat. Like most breakfast items French toast is best when made at home.